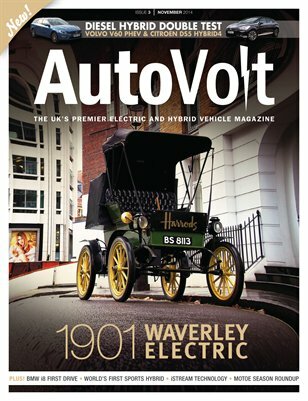 Main feature articles in this issue are: - We gain exclusive access to Harrods' 1901 Waverley electric car and follow them on their 2014 London to Brighton Veteran Car Run. - Diesel hybrids are uncommon but gaining in popularity. We take a look at two of the best, the Citroen DS5 Hybrid4 and Volvo V60 PHEV. - We take a first drive in BMW's i8 sports hybrid; is there anything not to like? Find out inside… - Technology: Gordon Murray Design's inspired iStream manufacturing process explained. - Honda's CR-Z was touted as the world's first hybrid sports car. We take a drive to find out if it's any good and provide a handy buying guide for used examples too. - Little is known about the world of electric motorbike racing but we went along to the final race of the inaugural MotoE season to find out what it's all about. Every issue is complemented by the latest EV & hybrid news, plus handy guides explaining electric and hybrid vehicles to both the beginner and enthusiast alike.